Catherine tops play on the edge of traditional masculinity with the stiff shirt collar and old school vest form, but mixes it up with an extremely feminine corset shape and a tease of a cut-out on the front. The crisp linen with the ladylike buttons creates easily a ringleader association with all the air of authority that includes. This vest can be turned into a dominant declaration of attitude or softened into a more flirty, circus-vibed look of eccentricity. 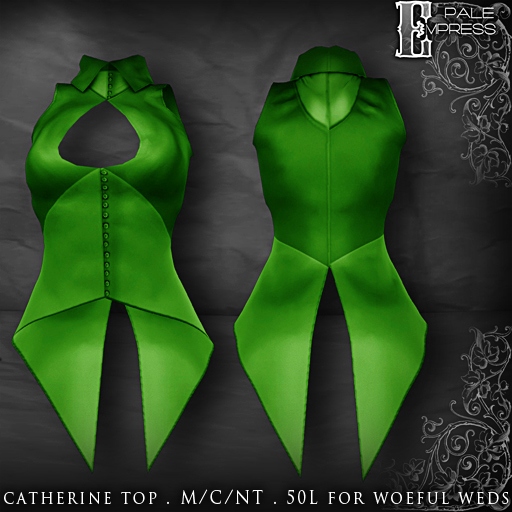 This Woeful Wednesday Pale Empress offers you a top from their latest release, the Catherine tops. Fresh from the pixel sewing machines, with more colors to follow soon! In the meanwhile come on over and grab this green beauty for mere 50L – but remember to buy it during the Wednesday!